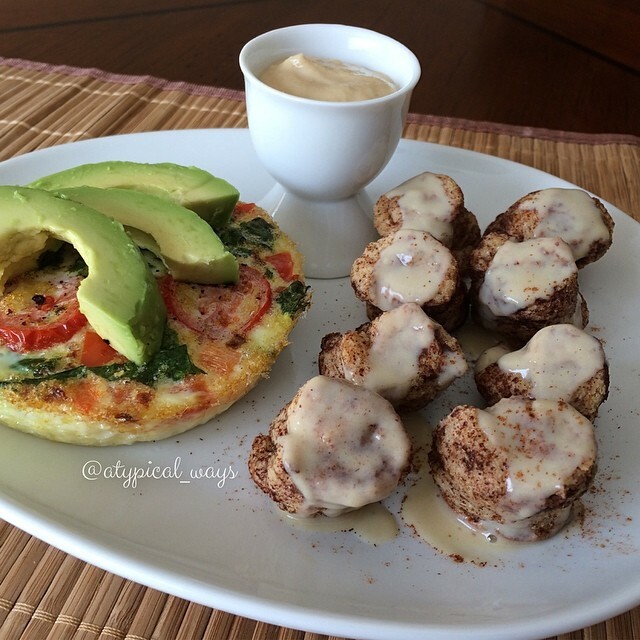 Mini Cinnamon Rolls with a Vanilla Protein Frosting & Vegetable Egg White Frittata – 365cal/32carb/11fat/38pro! Preheat oven to 375. Make frittata first by mixing 4 egg whites with red bell pepper, kale, red pepper flakes and pour into oven safe dish. Top with tomato slices and fresh ground pepper and place in oven. Frittata will bake for about 20-25 minutes or until egg is set. While frittata is in the oven, cut crust off of all bread slices and flatten them with a rolling pin. Mix 2 egg whites, 1oz of milk, 1/2tsp of vanilla & 1/2tsp of cinnamon in a small bowl. Soak each piece of bread (both sides) in egg mixture until soaked through and lay on a flat surface. Sprinkle the bread with 2 stevia packets & some cinnamon. Roll each piece of bread up and cut in half. Place cut up cinnamon rolls in a mini muffin pan & bake in the oven with the frittata for 10-11 minutes. For the dip, mix the protein powder with the milk & remaning stevia packet. Remove about a 1/4 of the dip and thin out with some water or more milk to make the frosting. 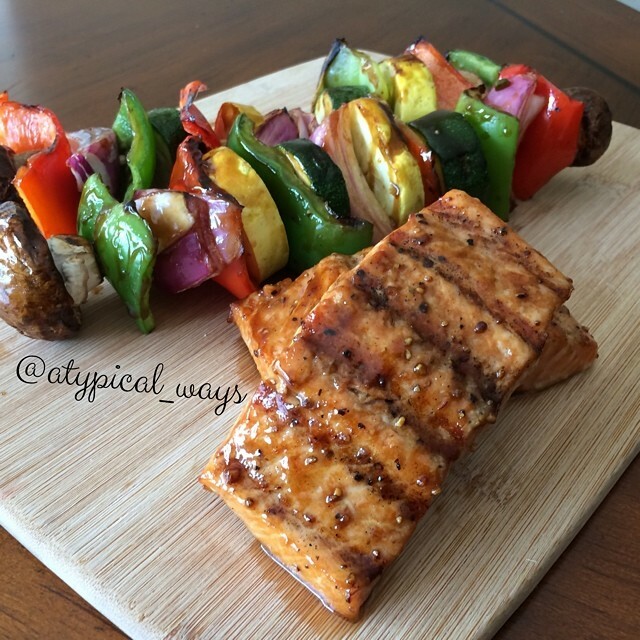 Grilled Jerk Chicken Salad with grilled pineapple & vegetables! In a small bowl combine the soy sauce & honey until well mixed. Cut up the vegetables and place in Ziploc bag. Wash & dry the chicken breast and season both sides with jerk seasoning mix. Place in the bag with vegetable and pour the soy mixture over everything. Allow to sit in the refrigerator for 1-2 hours. Preheat grill to medium high heat. Grill vegetables and chicken. The vegetables will cook faster so make sure to remove before burning. 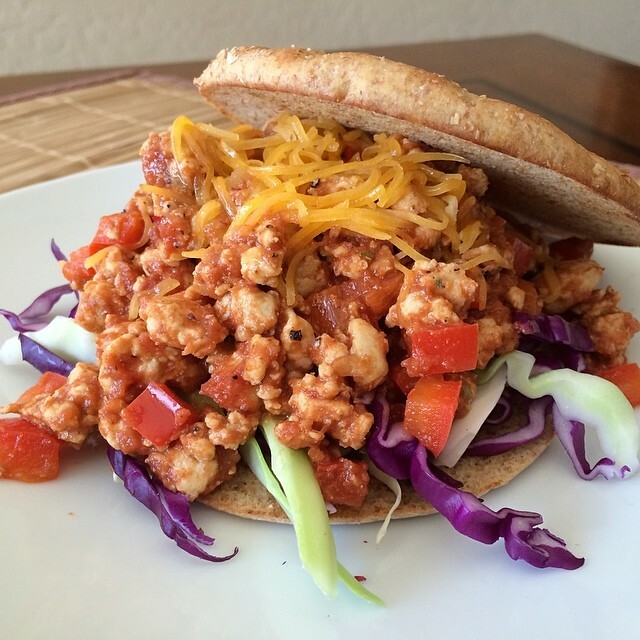 Chicken will cook 5-10 per side depending on chicken breast thickness. Add the pineapple slices to the grill for the last 5 or so minutes, flipping once. 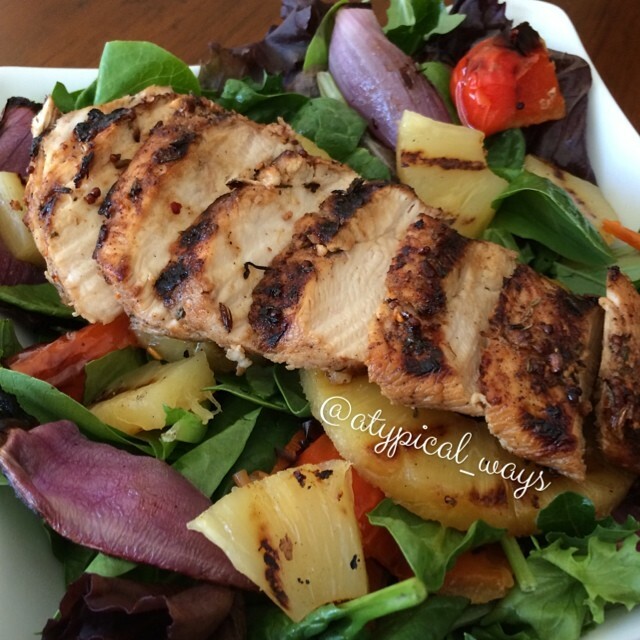 Slice chicken and serve on top of mixed greens with vegetables & pineapple.